3/11/2005 11:16:04 AM Mountain mjs:: thanks for the encouragement mm: This stuff is both easy and hard just depends on the day. One book I got for $0.98 was Larry Livermore's Reminiscences fo a Stock Operator. Great encouragement reading about trading and living life.He made and lost millions back in 1895-1930. A lot of his trades you can understand as Astro Trades (for unknown reason to him he shorted the market 2 days before the San Francisco earthquate in 1897 but we know he was tuned to the planet conjunctions that really caused it - many of this other trades can be explained that way he had a "feel" for the market) Also gives you appreciation for how big operators like banks etc trade and think and it hasn't changed in over 100 yrs as man has not changed nor have the planets. The longer your perspective the better off you are. 3/11/2005 9:56:53 AM Mountain wlj:: speaking of books i just received as a gift the book al has mentioned " trading in the zone " by mark douglas . there is another hard cover book with the title trading in the zone, by ari kiev ? 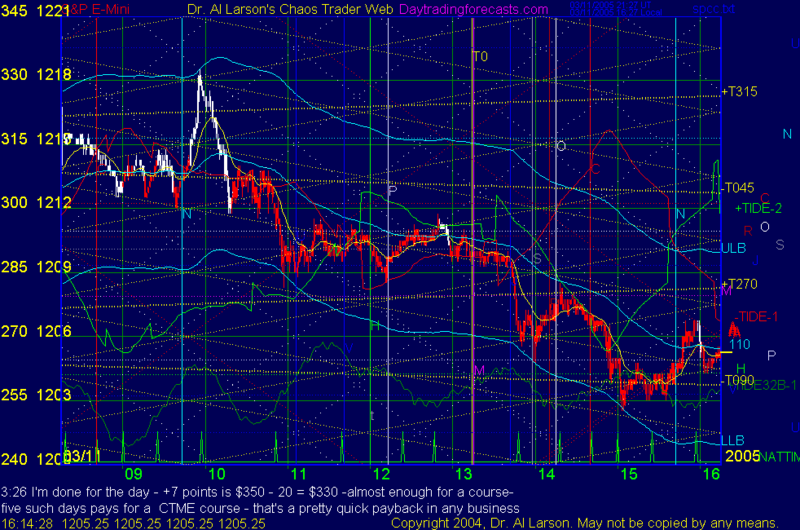 3/11/2005 9:45:29 AM Mountain mjs:: here's a tip on trading psychology. My better half got me a book down at the Salvation Army were we try to buy our things as we are against the big corporate enerprises and the profits really go to help people. She got me "The Journey" which is a Bible for seeking GOD. It is annotated with understandings and references etc so you can see how it is all intergrated and learn concepts some of our pea brains have a hard time grasping. Anyway if you get Trader's Block or run into a string of losses it is a great way to come back to earth and get back in the zone the Library of Congress # is 95-62351 published by Sondervan Publishing House. You might even get religion if you don't already have it. You will understand the forces we are makeing $$$ on here. Question is what are we doing to do with it? 3/11/2005 9:12:50 AM Mountain mjs:: Here's a tip on education. Superbookdeals.com (Trader's Books) has a special. They are cleaning out old stock If you buy $25 worth shipping is free. I got two boxes of books all cost me $ to $5 and it is amazing the ideas people can get published. The one I liked best was on Gann trading where you got a video and the guy shows you how on $30,000 he made $7,000 in one year with a drawdown of $10,000 and he is selling this kind of stuff. Makes you wonder about human intelligence. 3/11/2005 9:01:04 AM Mountain mjs:: I moved my M,V,R cycle 60 min and it signaled that turn to be coming at 10:48 and it arrived 10:51 unfortunately I was projecting a move up based on how my action was aligned with the curves. 3/11/2005 8:56:34 AM Mountain mjs:: here's a bit of intelligence for you cycle fans. I worked in the Division of Corporate Finance at the SEC Wash DC from 77-80. The Chief Financial Analast there (he headed all the FA at the SEC) had Brenner's Chart framed on this wall. As the ebb and flow of IOPs etc came and went he would just point to it and say "Oh! we are now here and we are going there". A real education in what experience is all about. 3/11/2005 8:45:51 AM Mountain mjs:: Hey wlj: it was an easy buy of $70 million from AIG with Merrill then doing the trading after the tie out (when we tell AIG which ones don't meet criteria). The bubble will last as long as GDP stays positive as to counter rate increases we are dropping credit criteria to keep up volume. The funny thing was one of the Due Dilligence consultants brought in his old news clips for 1986-1990 when RE and mortgage world tanked last time. All our concerns were well described in those old papers. Best estimate for ETA of RE bust is 2006-08 but it could be a wimper as it isn't the homeowner who decides it is the mortgage holder who advances the loans and from those 1980s news clips we were reminded of all the tricks people will play to keep the game going even when the writting is on the wall. It will take a maor recession and 10% unemployment till then plenty of waitresses and cab drivers want the dream of homeownership and plenty of lender are ready to accommodate them. Still we made our 25 basis points of $1.75 million for 3 days work. 3/11/2005 7:32:51 AM Mountain mjs:: Da Monkey is trading today: Monkey see Monkey do following the Tides and cashing in on chaos. Looking for banannas today.